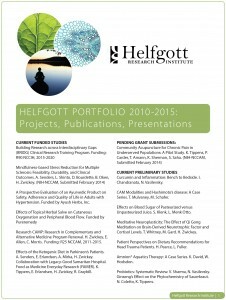 The term “complementary and alternative medicine” represents a wide range of medical systems and treatment modalities, and the variety of research projects at Helfgott reflects that diversity. At Helfgott, investigators with backgrounds in immunology, nutrition, naturopathic medicine, Chinese medicine and acupuncture study natural medicine modalities on a range of clinical diagnoses. While some of the studies look at alternative medical systems as a whole, such as naturopathic treatment of diabetes, others focus on specific therapies, such as mind-body interventions and their effect on the immune system. From basic science studies to clinical trials, our goal is to find out what natural medicine therapies work, why they work, and to develop methodologies for studying modalities that don’t always fall into the traditional biomedical model of research. Please browse the menu on the left to learn more about our current projects. If you would like to contribute to our work, please donate online. Current study participation opportunities are listed on the Study Participation Opportunities page. 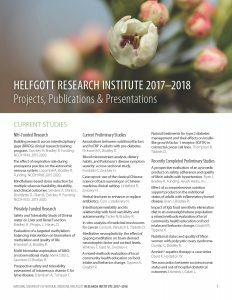 To get a greater sense of the projects Helfgott and NUNM is focusing on, please visit NIH’s website for more info on NIH projects.